Tchinda is one of most beloved women in Cape Verde, especially after she came out as a transgender person in the local newspaper in 1998. From that point on her name has become the Camp Verdean name for gay people. Since then, her name has become the term used by locals to name queer Cape Verdeans. Despite Tchinda’s great reputation, she remains humble and every afternoon she happily tours the neighborhood to sell her best “coxinhas”, a classic Brazilian treat: delicious fried balls of chicken. Come February everything changes. February is the month before the carnival season and during that time the slow pace of the island changes as people begin to prepare for their holiday. Carnival means hustle and bustle as thousands flock to the streets and the days before the Carnival are hectic. Locals join forces to create something beautiful out of nothing. It becomes a «Little Brazil» as their most acclaimed singer, Cesária Évora (1941-2011), defined in one of her most famous “mornas”. This documentary is as trip to an unknown side of Africa that very few may have ever imagined. As Tchinda is hard at work preparing for a Carnival, she hopes that she will capture the town’s imagination. Tchinda is openly transgender and deeply respected. Her choices, direction and vision centralize a collection of people that few beyond the island even know are there. Filmmaker Marc Serena brings us a perceptive documentary; ”Tchindas” reveals a “hidden landscape tucked far away from the world we know, where trans inclusion and teamwork make up the fundamental structure of a truly magical community and culture”. 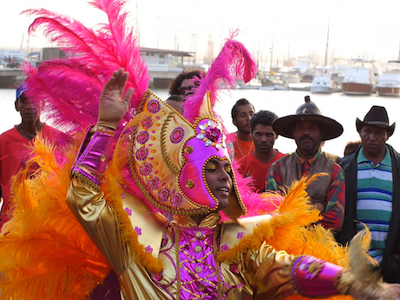 In São Vicente, the year starts and ends with the Carnival. It is actually the center of many people’s lives and the film shares the emotion that so many have and it is a beautiful, sensitive, poetic celebration. This entry was posted in GLBT documentary on July 5, 2015 by Amos.